Fifty years ago, Ford Motor Company, Shelby American and Hertz teamed up to introduce the 1966 Shelby GT350-H – kicking off what was known then as the Hertz “Rent-A-Racer” program. To celebrate 50 years of the famed Shelby GT350-H “Rent-A-Racer,” the three iconic brands have partnered again to create a special run of performance-modified 2016 Shelby GT-H vehicles. Beginning this summer, a limited number of 2016 Shelby GT-H vehicles will be available for rent exclusively through the Hertz Adrenaline Collection at select U.S. airport locations. The 2016 special edition Ford Shelby GT-H marks another Hertz car rental milestone in offering high-performance and specialty vehicles throughout the company’s history, and today through its Adrenaline, Dream Cars and Prestige collections. The 2016 Ford Shelby GT-H is instantly recognizable with several styling enhancements that celebrate its heritage. 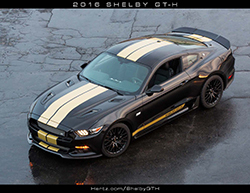 Each Shelby GT-H wears black exterior paint, set off with gold racing stripes, a hallmark of the Hertz brand dating back to the 1920s. Shelby’s traditional "Le Mans" dual racing stripes are combined with a set of rocker stripes that include special "Shelby GT-H" nomenclature. Each car sports a Hertz Edition emblem on the front fenders, and features Hertz Shelby GT-H sill plates and a numbered badge. Special badges appear in the front grille, rear faux gas cap and trunk lid. Inside, Shelby GT-H logos are on the head restraint, sill plates and floor mats. To hint at the 5.0 liter V8 engine’s capabilities, the Ford Shelby GT-H is fitted with a unique Shelby-designed vented hood, carbon fiber front splitter and rear spoiler. The 50th Anniversary 2016 Shelby GT-H is packed with performance parts that embody the iconic Shelby design. Ford Performance cat-back performance exhaust for that throaty sound that makes this car unmistakably a Shelby Mustang GT-H.
To put all of the horsepower to the ground, the Ford Shelby GT-H also comes with the Ford Racing Handling Pack, including special-tuned dampers, lowering springs, sway bars and a staggered wheel kit. The Shelby GT-H rides on 19-inch aluminum wheels wearing high performance Michelin rubber. Witness the build of a legend. Click here to watch the time-lapse build of the first 2016 Shelby GT-H.
To learn more about the 2016 Shelby GT-H, download the brochure. One of the biggest names in show biz and car collectors in the world spotlights the famed Hertz Shelby GT-H “Rent-A-Racer” program in celebration of its 50th anniversary. Former Tonight Show host Jay Leno features the legacy and history of the program in a special web episode for his latest TV series Jay Leno’s Garage.